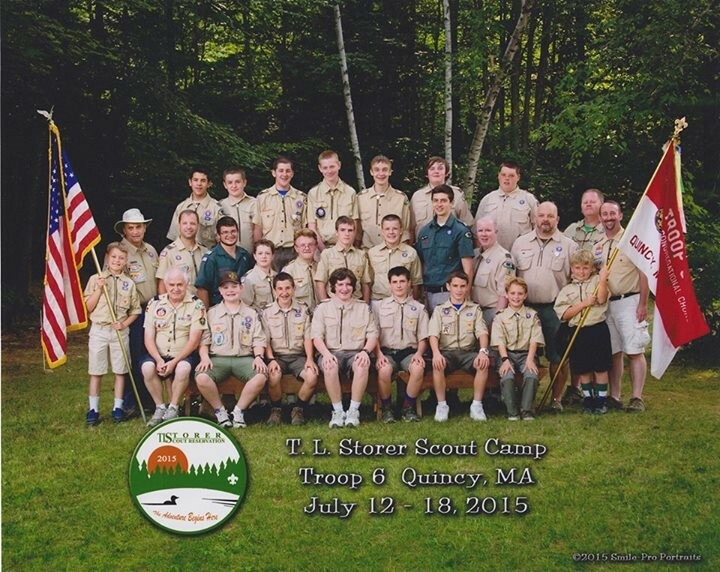 Troop 6 had a fantastic week at summer camp back in July, with 19 scouts, half a dozen leaders, and 2 of our scouters on staff for the summer. The Troop earned nearly 50 merit badges, learned primitive skills, outdoor cooking skills, swam, boated, climbed, hiked, and generally had a great time. The boys made us all proud and we are looking forward to handing out all of their hard earned badges at our Court of Honor on August 31st. The boys would also like me to extend a huge “Thank You!” to all of the leaders who spent time with us that week, including: Mike Berry, Shawn Donahue, Rob Gordon, John Toler, and Patrick Walsh, and our part timers – Aaron Cavin, Ralph “Bampy” Jacobs, Brian Laroche, and Rich Sutherland. We are starting the new year off with our Court of Honor and registration night on August 31st, and although we are taking Labor Day off, we will be very busy planning for our first camping trip of the year at our first meeting on September 14th. We are going all the way up to Acadia National Park on the coast of Maine to do some hiking and exploring during the weekend of September 18-20th. Our Troop is always open to new scouts and September is the best time to join! Scouting is open to all boys from Grade 6 to age 18, and we try to foster good citizenship, community service, life skills, and a strong love of the outdoors while having a heck of a lot of fun along the way! Parents are welcome to contact me, Rob Gordon, rpgordon@comcast.net at any time if you have questions, or feel free to stop down to the Houghs Neck Congregational Church on Monday nights from 7-8:30PM. Our next bottle drive is September 12th from 9-12 in Labrecque Field parking lot, and will continue to be the second Saturday of every month. Please remember that the bottle drives are our main means of fundraising for the Troop, and we really appreciate your contributions. Please feel free to call if you need a pick up!